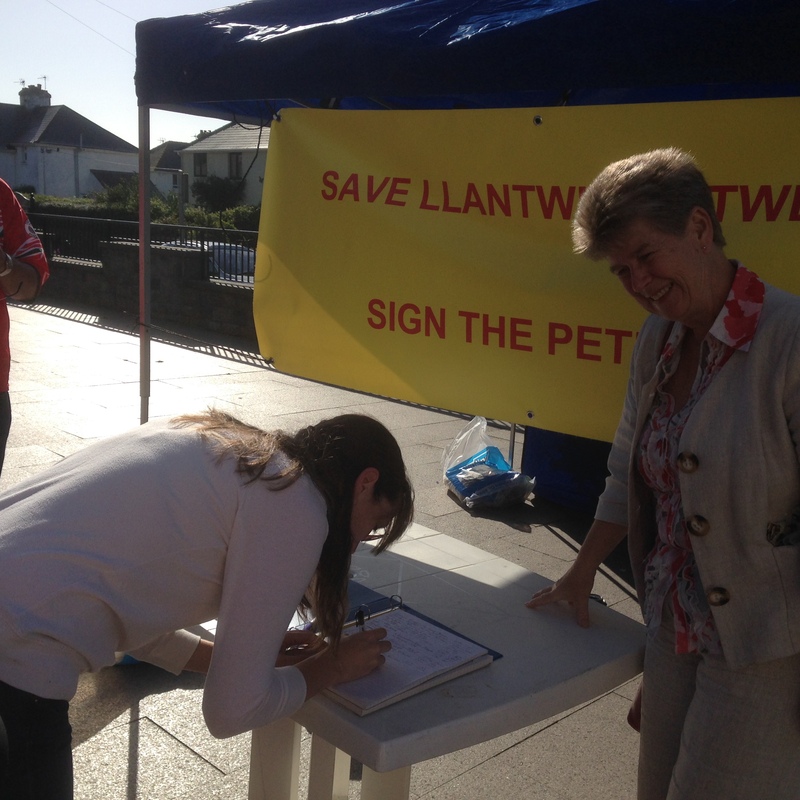 Jane and Cllr Gwyn John have been heavily involved in the campaign to stop NatWest closing the Llantwit Major branch. As soon as Jane was notified of the potential closure, she organised a public meeting in Llantwit Major and invited local residents and businesses to come along to voice their concerns directly to her. The bank had notified that they intended closing the branch on 25 November 2015, and that it would be replaced by a limited Post Office service, ATM, a mobile bank visiting once a week, or the option of travelling to the nearest branch, in Cowbridge. One of the reasons given for the closure was that the number of transactions taking place at this branch had allegedly dropped by 14% since 2011. 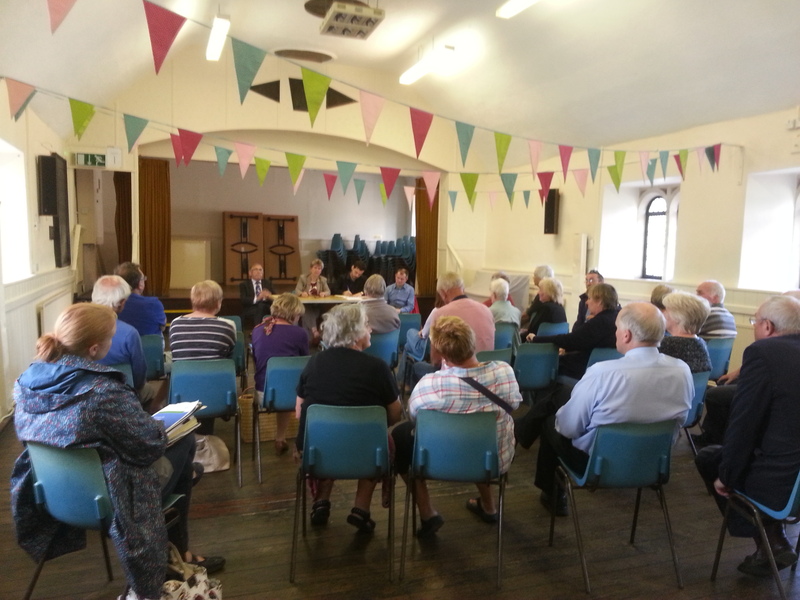 The public meeting was held on 18 September, and about 50 people attended, all voicing strong oppostion to the closure and disputing the figures used by NatWest to justify their decision. Speaker after speaker told the meeting how the closure would adversely impact on their own lives as well as the wider community and business, and there was widespread concern about the manner of the closure which was thought to be a ‘done deal’ with no consultation. The meeting was addressed by Finn Travers-Smith from the Move your Money campaign, and with Jane’s help a petition was launched. Campaigners set up the Save Llantwit Major NatWest Bank Facebook page and organised a rota of people to monitor bank usage and to ask anyone visiting the bank to sign the petition. Jane set up a meeting with senior NatWest officials and wrote to UK Government Minister, Sajid Javid to protest on behalf of the Llantwit Major community. A team of volunteers, led by Don Knight and Paul Browning, collected a very impressive 2,277 signatures opposing closure, in only ten days. Jane issued a press release stating that “Llantwit is a major town in the Vale of Glamorgan-it isn’t acceptable to simply tell customers they can go to Cowbridge to do their banking. I have written to NatWest outlining the adverse impact of the closure for customers, local people and businesses, carers, voluntary groups and surrounding villages’. On 5 November a debate took place in the UK Parliament on NatWest/RBS bank closures. Local campaigners were urged to contact their MP to seek his assurances that he would attend the debate, to represent them and to speak up against closure. As the campaigners pointed out, the UK government has the power to stop NatWest closing branches like this one. Unfortunately, the Vale of Glamorgan MP did not attend the debate. Natwest bank in Llantwit Major CAN stay open! 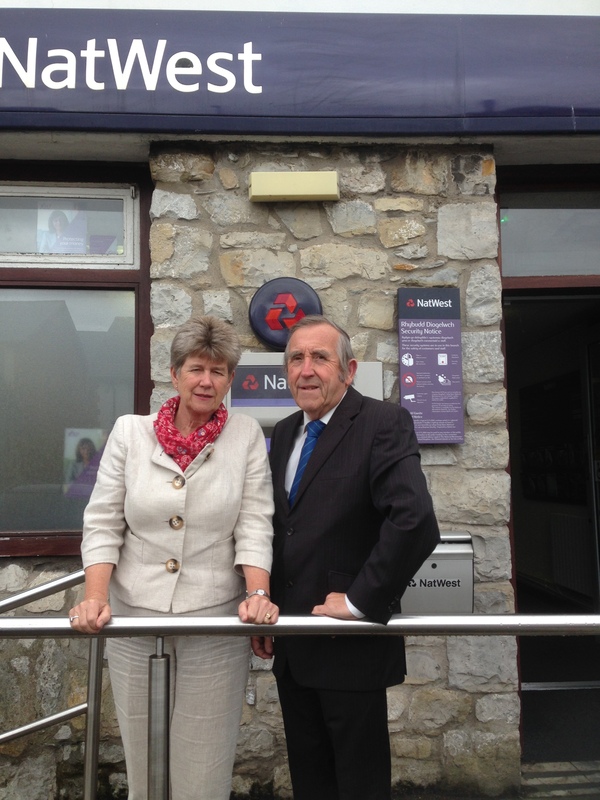 The Natwest Bank in Llantwit Major CAN stay open- say Jane Hutt AM and Councillor Gwyn John- if bank chiefs accept a proposal by a local business to keep it open on a part-time basis. Jane Hutt AM and Cllr Gwyn John say that with strong public and business support to keep the Natwest bank open, an offer by a local business to acquire Wyndham House and lease it back to the bank on a peppercorn basis should now be accepted by the CEO and Board of Natwest Bank. “We are going to the top of Natwest bank to get our message heard that the bank in Llantwit can stay open on a part-time basis thanks to the offer of a local business. We know Natwest has part- time premises elsewhere in the Vale (Dinas Powys) so they can and should accept this cost effective solution in Llantwit! Jane is full of admiration for the campaigners who have done so much to raise awareness of the impact of the closure of their bank, and for Cllr John who has worked so hard on behalf of local residents and businesses. Jane is determined to do all she can to persuade the NatWest and the UK Government to keep the Llantwit Major NatWest bank open!